This year we celebrated the 50th anniversary of Gordon Moore’s famous paper “Cramming more components onto integrated circuits”, the basis of Moore’s Law. Remarkably enough, it was my college advisor who coined the phrase. So what has Moore’s Law meant for test equipment and the associated industry? A lot. For one thing, an explosion of product categories, a trend that is likely to continue. In my latest column I document the rise (and fall) of test and measurement product categories through each decade. I also document the rise of new companies along with these categories: Teradyne, Advantest, Spirent and Ixia, to name a few. What does the future hold? 5G wireless and IoT (Internet of Things) are ripe for spawning new test categories. It is challenging to predict exactly how this will play out, but the vendors that can foresee the changes and define these new categories will reap rich rewards. You can read my entire column here. 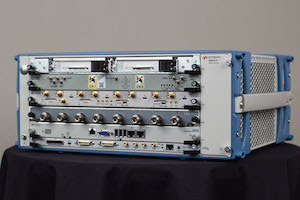 Designing your first PXI test system? Start inside out. 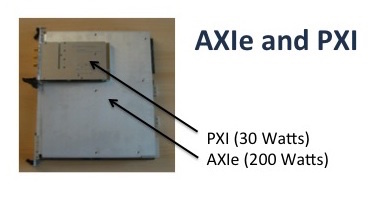 I’ve written several tutorials in the past on how to integrate PXI and AXIe modular systems, and how to combine them with traditional instruments based on LXI. A key concept in doing so is to think inside out. I describe each step, and how each leads to narrowing your choices for the next steps. You can read the entire tutorial here. Last November I wrote about the recently released Frost and Sullivan report that predicted PXI to disrupt the automated test market going forward. Frost and Sullivan predicts PXI to grow at an aggregate growth rate of more than 17%, achieving $1.75B in annual sales by 2020. This is significantly more than the 3% secular growth rate of the test and measurement market. In fact, my arithmetic at the end of the column concludes that all the growth of automated test over the next several years is coming from PXI. In that article, I stated that this matches my own estimates. In particular, if you combine Porter’s 5 forces with Nobel Laureate John Forbes Nash’s game theory mathematics, you can see the patterns that are igniting this disruptive change. I’ve written about game theory in our sister publication EETimes. Give it a read to see how game theory explains industry structures. While game theory explains the actions of major players, Porter’s 5 forces explain the context of the industry, essentially the rules of the game. Today, I’m going to review the five forces, and how they collude to accelerate the modular disruption. To read about Porter’s 5 forces, and specifically why they are colluding to cause the modular disruption, read the entire article here.